The first trigger housing used with an M1 Carbine was a modified Winchester M1907 trigger housing used in Winchester's first prototype submission to the Ordnance "light rifle" trials in August 1941. The first design was further modified for Winchester's second prototype, adopted September 30, 1941 as the Carbine Caliber .30, M1. 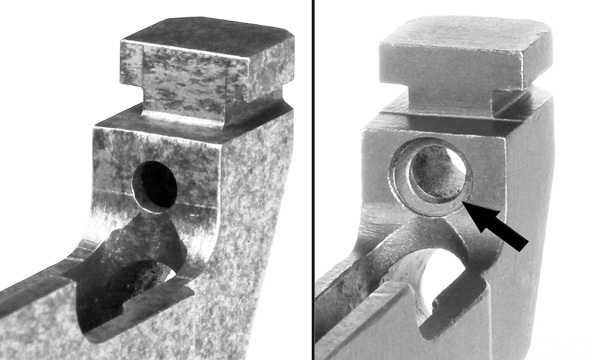 During the months following the adoption of the Winchester design, both Inland and Winchester produced a number of variations of the trigger housing and other parts as prototypes for testing. Since these housings were prototypes and not used during production they are not covered in detail here. Example of one of a number of prototype Trigger Housings that preceded the type I housing. At the time contracts were issued to each contractor and subcontractor for manufacturing trigger housings, each of these companies had a variety of different machinery available with which they accomplished this task. As a result, machining variations exist that were specific to a particular contractor or subcontractor. 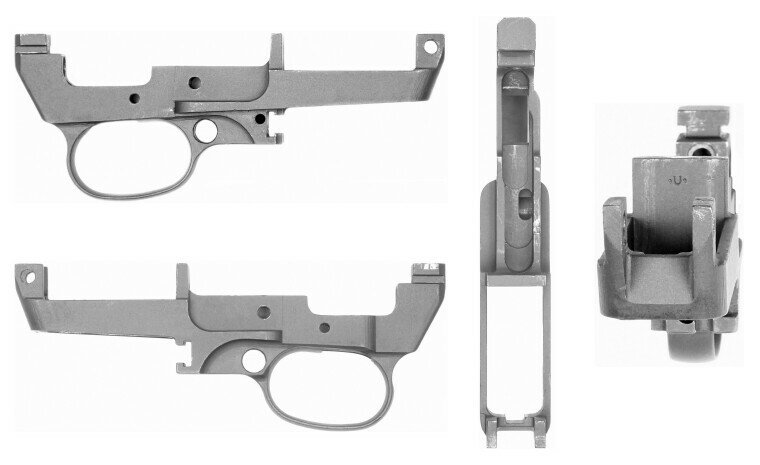 These variations did not affect the design and/or function of the trigger housing specifications as set forth by U.S. Army Ordnance. 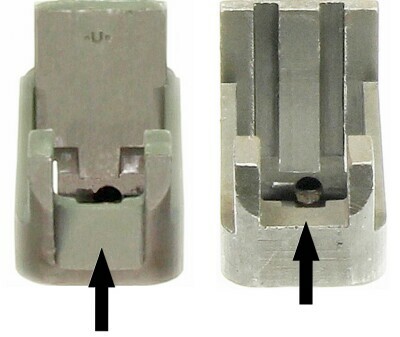 They were simply different machining methods to produce the same end product. 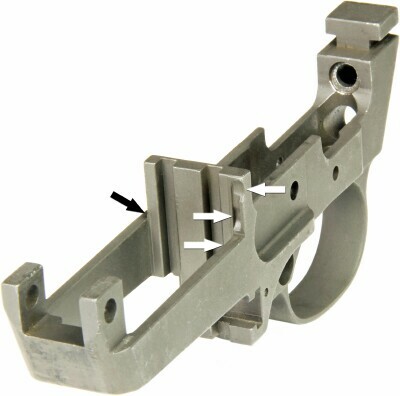 Several contractors/subcontractors had more than one method of machining the trigger housings, resulting in slight variations from the same manufacturer. of the magazine well. This was simply out of necessity due to available machinery. 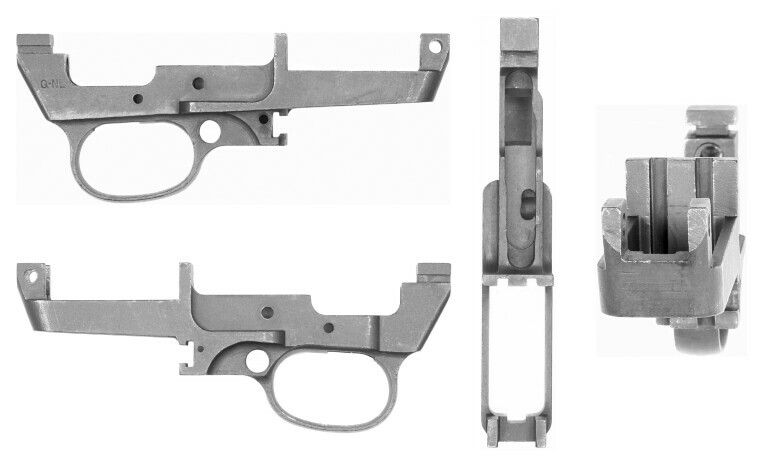 M2 trigger housing was standard for all housings used with a select fire mechanism to accommodate the disconnect lever. 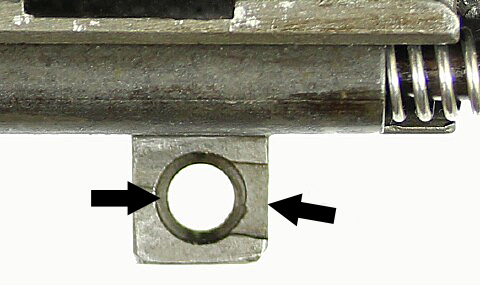 a quarter circle or less is on top of the magazine well side walls, directly behind the housing's front retaining lugs (black arrow). 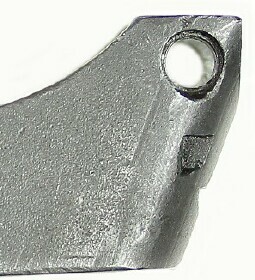 Less common is a partial hole on either side of the lug at the rear of the trigger housing. Saginaw Steering Gear inherited these machines when they took over production at the Irwin-Pedersen Grand Rapids facility. 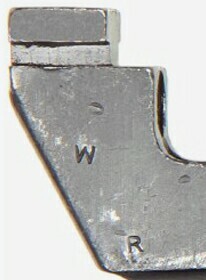 sides of the rear lug (white arrow at rear) and/or on top of the sides at the front of the magazine well (black arrow). The holes varied in depth and often did not fully penetrate through sides. The vast majority of trigger housings were marked with the letters assigned to the prime contractor or their subcontractor who manufactured the housing. 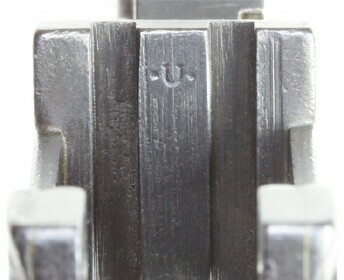 Late Winchester trigger housings tend to be stamped lightly. The W may be hard to see or appear absent. and mag catch, the meaning of which was only known to Winchester. 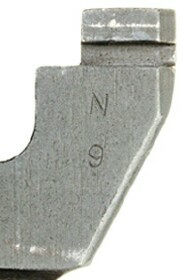 the lower numbers appearing on their earlier trigger housings. was usually stamped on the bottom of their trigger guards. 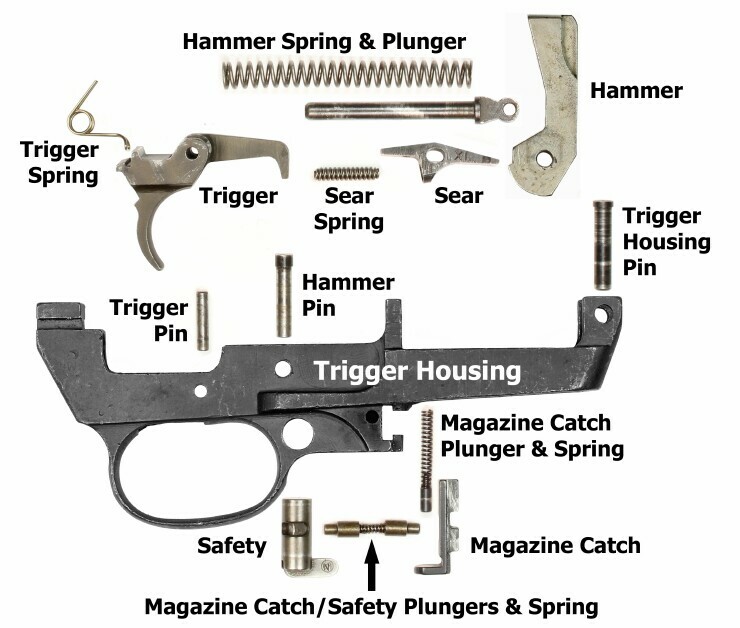 For the purpose of consistency with the current commonly used terminology the trigger housings shown here are grouped into six different "types". 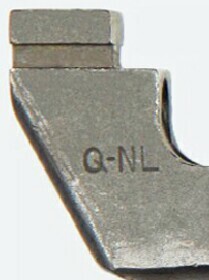 Although these types are numbered sequentially I - VI, several of these types were manufactured and used concurrent to one another. Five of the six types of trigger housings were machined from a solid steel billet and varied only slightly from the first to the last. 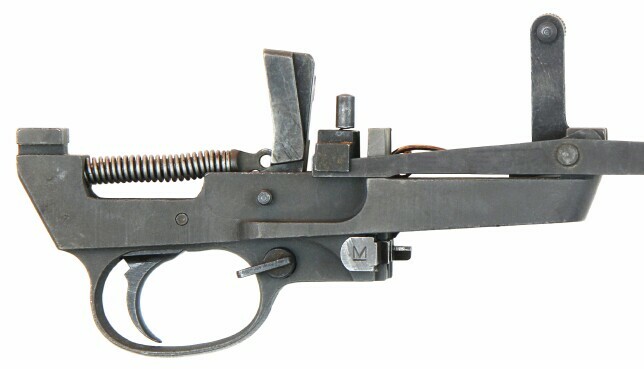 Types III, V, and VI were the same milled trigger housing. 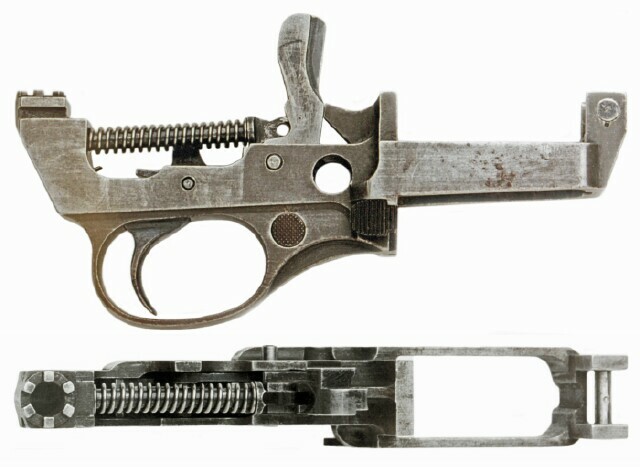 The difference was one small hole added late in production (type V) and/or the cuts necessary for a select fire mechanism (type VI). These differences are discussed in detail below. 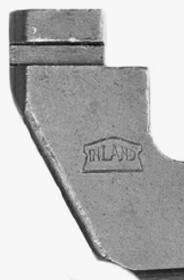 The type IV housing was made of stamped steel panels brazed together, making it unique and easy to identify from the others. All six variations could be used on any M1 and/or M1A1 Carbine, regardless of who manufactured it and/or when. The M2 Carbine and other models converted to select fire required the type VI housing or an earlier housing converted for use with the select fire mechanism. Not one of the prime contractors and/or their subcontractors manufactured and/or used all six different types of trigger housings. Underwood was the only company to manufacturer and use types I-IV. Saginaw Steering Gear's Saginaw facility manufactured and used the type III housing only. IBM used only the type IV trigger housing. 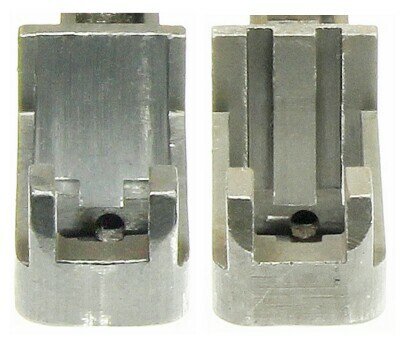 The type V and VI housings were only manufactured by Winchester, Inland and Springfield Armory as all other companies had ceased carbine production by the time the type V housing was introduced. As all companies served one master, U.S. Army Ordnance, when one contractor's inventory ran short of a particular part it was common for another company to provide parts from their inventory to keep production running. This was referred to as "integration" and fairly common with one part or another. Integration was often documented but not always. War Baby Volume I by Larry Ruth documents many of these occasions. Usually when a prime contractor received trigger housings from another prime contractor, the original markings were not changed or altered to indicate which contractor actually used the housing. Incorporated December 19, 1941. The rear wall inside the magazine well on type I trigger housings was the narrow style. before learning the hard way. Many, but not all, of these early Inland type I housings were later counter bored as shown above. 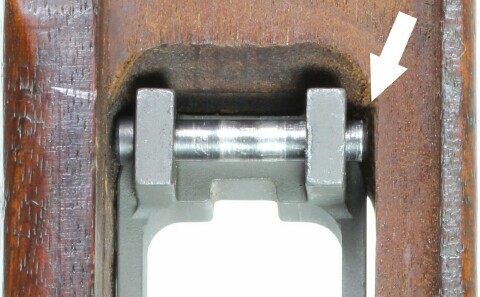 Same design as the type I except for the machining of the metal between the uprights at the front of the trigger housing. leaving the lug square. Introduced during the summer of 1943. The type III trigger housing was the only housing manufactured by Saginaw Steering Gear at their Saginaw facility. 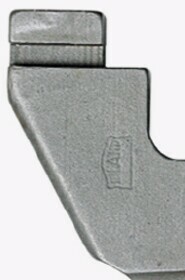 of the type IV trigger housings featured the full length vertical cuts in a wide rear magazine wall. This housing was incorporated May 22, 1943. The plates and copper brazing are easily observed on the outside of the housing. The hole for the trigger housing pin was recessed so the pin fit flush with the side of the housing. Type IV trigger housings were the only trigger housing used by IBM. Inland participated in their research and development but did not use them in production. case hardening after brazing timed with cutbacks in carbine production made this version less preferable than the milled trigger housings. documentation. It is believed to have been for cleaning, lubrication and/or drainage. 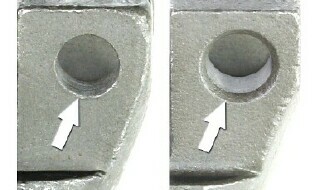 The small hole was sometimes added to earlier trigger housings during the post war rebuild process. Recommended for adoption concurrent with the M2 Carbine September 14, 1944. Produced concurrent to the type V housing which was made for use with the M1 Carbines. for the disconnect lever. 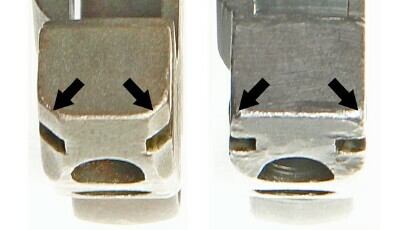 The left side was notched (white arrows) to hold the selector spring. and hammer as the disconnect pushed and held the sear down for full automatic fire. Types I, II, III, and V on left, Type VI on right. weld that attached the trigger housing pin to the disconnect lever. After the introduction of the M2 Carbine many semi-auto M1 Carbines were converted to select fire without changing the M1 to an M2. 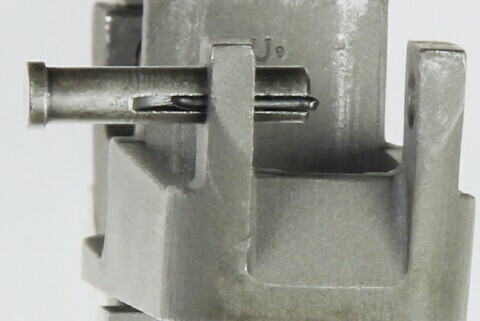 Their trigger housings were modified to function with the select-fire Disconnect Lever and Selector Spring but are absent the counter bored trigger pin hole of the M2 trigger housing. Those modified retained their earlier features. 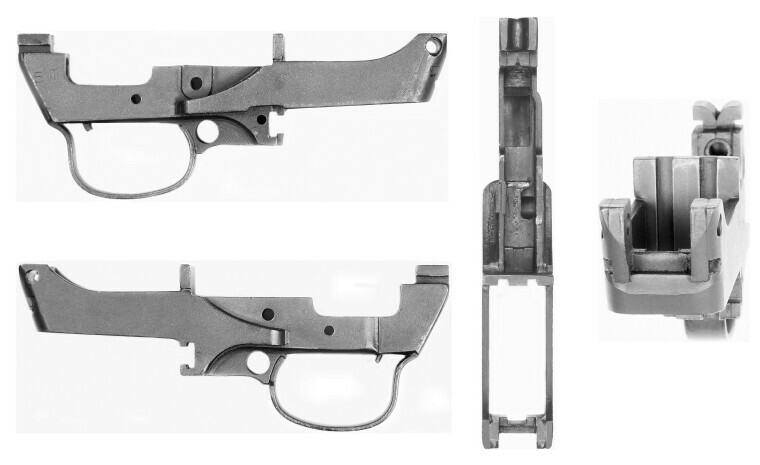 The small hole on the left side of the trigger housing was sometimes added to the earlier trigger housings during the post war rebuild process but was not necessary for select fire operation. The design and construction of the type IV trigger housings (welded & brazed) was inherently unreliable for conversion for use with select fire parts, although a few have been found to have been converted for use with these parts. 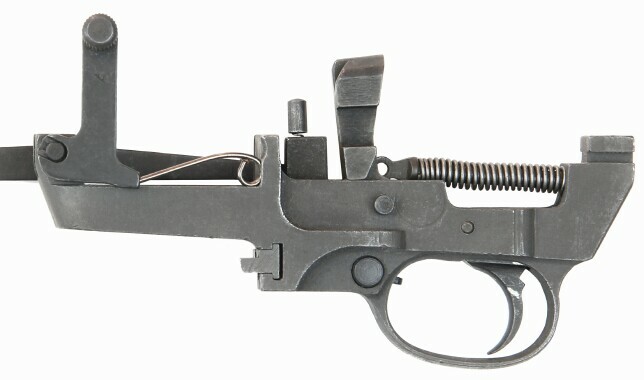 Note the absence of the small hole, indicating this was a type III trigger housing later converted for use with a select fire carbine. Length: .875" - Diameter: .177" - Head Diameter: .2"
right side of the trigger housing when the housing was removed from the receiver. of the trigger housing lug so the pin would clear the lug during disassembly. 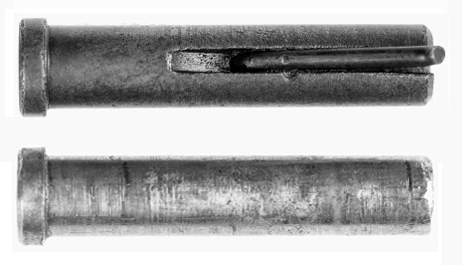 The early spring loaded pin was replaced in early 1943 by a simplified trigger housing pin used throughout the majority of production. Typically the fit of this pin is slightly loose. 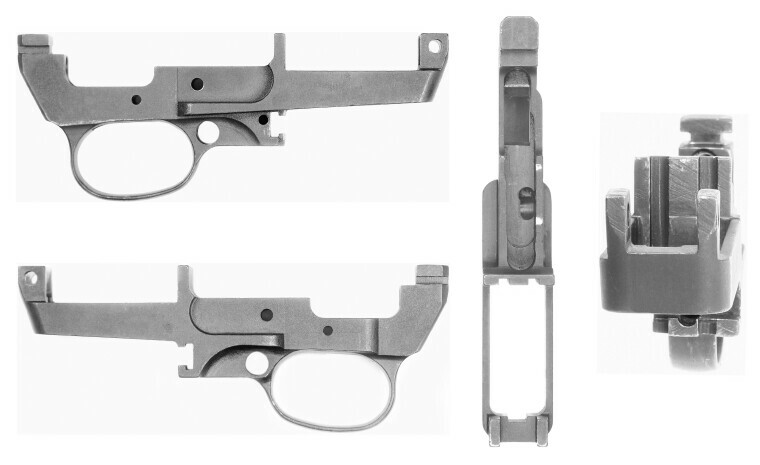 It is held in place by the stock when the carbine is assembled.